Finished front and back of the invitation! perforated matte textured postcard paper with invitation text on it. Peeling the invitation back from the stamp to reveal the work. How I created these hand stamped and homemade works of art. These invitations were really much simpler to make than they seem. And loads of fun too. I started by purchasing some postcard paper from the local office store. The postcards were a perforated, matte paper with a bit of texture which I liked to keep them interesting. I liked the added detail! Plus, it helped to hold the ink a little better. For the love bird decorations on the invites, I sketched out two birds sitting on a branch, and also some flowers to place above them. I copied the sketch to a linoleum block and carved out the reverse of what I wanted the final image to appear as. I did the same on a couple other smaller blocks with the same images yet in smaller scale. 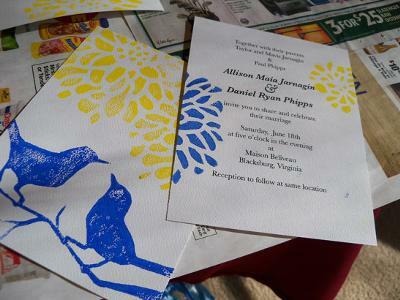 I used a speedball ink roller and some print maker's ink to apply blue and yellow paint to the handmade stamps. I applied the lino blocks to my postcard paper with thin amounts of ink on them. You need to be careful how much ink you use so as to not make a big mess. If you have to much ink it will leak out on the edges and make the whole image blurry and messy looking. I hung my lovebird invitations up to dry. With help from several bridesmaids I was able to repeat the process over and over to make all 110 of my homemade invitations! Once the back sides were dry I used my separate smaller scale flower stamps to put one blue and one yellow flower on the backside of the invitations. What is great about creating your own custom stamp for your wedding invitations is that now you could use those same stamps to create EVERYTHING. Again with the help of my bridesmaids we stamped table cards, table numbers, RSVP cards, programs and various other things that will be set up around the reception. You can even switch to silk screening ink and stamp onto fabric items! 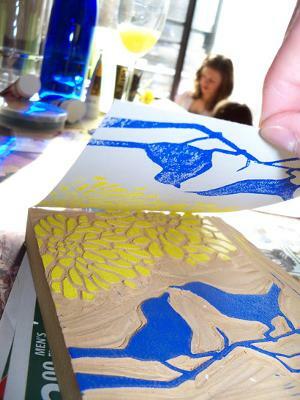 Lino block printing really is so fun! 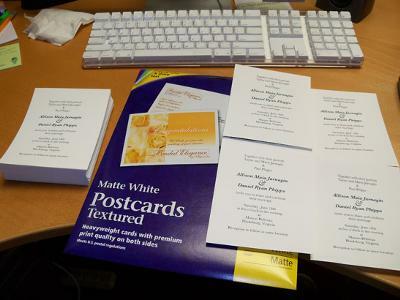 And a great way to create wedding invitation stationery that is completely one of a kind. And Allison is right! 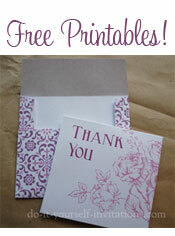 You can use those homemade hand carved stamps to make so many other items and wedding crafts. Lino Block carving really is not all that hard. And pretty inexpensive. 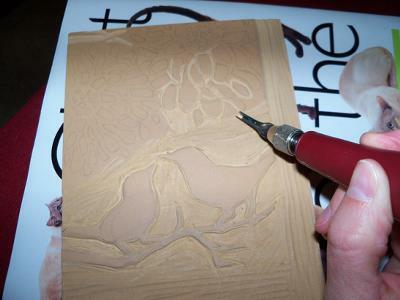 The linoleum blocks can be found at most art supply stores, along with the Speedball carving tools and ink. And here is some great news! 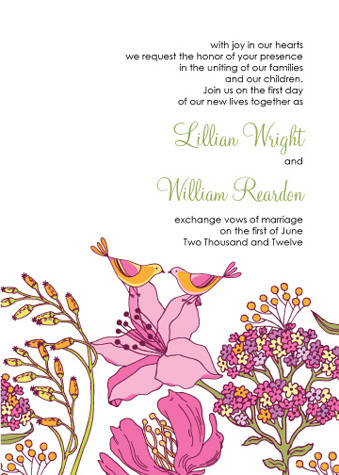 You do not have to know how to sketch or draw to make your own images for your invitations! I have a little trick to help you with this part - Tracing paper! Scour some old books, photography, or just plain search the internet. Find photos or vintage graphics that suit your fancy. Trace the image onto tracing paper using a regular #2 pencil. Next lay the tracing paper onto the lino block with the lead from the pencil facing downwards and rub the paper gently to transfer the image from your paper to the lino block. Viola! Now you can start carving your image! Don't have the time for all this sketching and carving, and hand stamping? 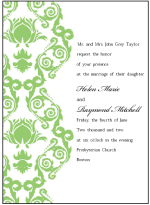 Why not simply print your own wedding invitations?